Celtic defender Adam Matthews revealed a shout from captain Scott Brown led to his wonder-goal against Hamilton Academical on Saturday. 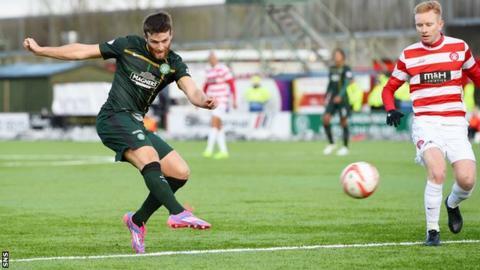 The Welshman smashed a brilliant strike into the top corner for the opener in his side's 2-0 win at New Douglas Park. And Matthews told the Celtic website: "Kris Commons played a good ball to me, and after I took my first touch, Browny shouted, 'Shoot'. "So I didn't think twice and luckily for me it went into the top corner." Liam Henderson added Celtic's second goal of the day as Ronny Deila's charges closed the gap on Premiership leaders Aberdeen to two points. And Matthews believes his side sent out a message to the rest of the title challengers with their victory over Accies. "The first 60 minutes was one of the best we have played all season, especially in the first half, when we caused them a lot of problems and could have scored a lot of goals," the 23-year-old full-back added. "But we scored two good goals, we're happy with the three points and the way we played and now we will be looking to kick on against Motherwell on Wednesday. "All we could do was apply the pressure and that's what we have done, not just with the result but the performance as well." Matthews' goal against Accies was his first of the campaign, as was Henderson's fine second-half finish. And the Welshman was not in the least bit surprised to see 18-year-old Henderson play a key role. "Liam has been brilliant for us," added Matthews. "Even last season, you could see how good a player he is, when he played a few games. "He has showed that in training this season, at Kilmarnock with the way he played and then against Hamilton with his goal."